In Donald Trump's first press conference after the election, he called CNN "fake news" and refused to take their questions. Trump's disregard for the mainstream media has caused a significant uptick in usage of the term "fake news". News sources from the left and the right have suddenly been called into question — but not for equal reasons. The Trump camp seems to only care about sources with a “liberal bias”. To Trump and his supporters, anything (whether through fact or opinion) that ends up opposing rightist positions or justifying leftist ones is deemed “politically biased” or “fake news” but conservative sources are not. The unspoken rule here is that conservatism is objective Truth, so if an article confirms conservative ideology, it is objectively true, but an article that rebuts conservative ideas is impure, tarnished by liberal bias obscuring the "Truth". By definition, Trump Republicans do not believe that a conservative source could be biased because, to them, conservatism is inherently unbiased. This idea of a singular objective "Truth" is a cornerstone of conservatism and gives rise to the right’s mistrust in science when it does not confirm their previously-held beliefs and to their distaste for the study of non-Western cultures. Trump specifically called out CNN on the day of his press conference (and the night before on Twitter) because of its coverage of Trump's ties with Russia. This reporting is counter to the Trump agenda, so he attacks it as a "political witch hunt." By many measures, CNN is a centrist organization, but its pieces on Russia work counter to the Trump agenda, so he insists that they must be tainted with a liberal bias. Trump's press secretary Sean Spicer is similarly only interested in the conservative narrative. On February 24, Spicer barred journalists from non-conservative news organizations like CNN and The New York Times from attending his daily press briefing. By only briefing organizations like Breitbart News and the Washington Times, Spicer and Trump are able to control the narrative. This manipulation of the media epitomizes everything wrong with Trump's definition of "fake news": he is blinding himself and the public to the benefits of perspectives that aren't his own and fostering a dangerous distrust for the media that threatens democracy itself. For private Americans, the definition of the term "fake news" is a bit more varied. Many on both the left and the right are primarily concerned with sources that knowingly fabricate stories and fudge numbers. 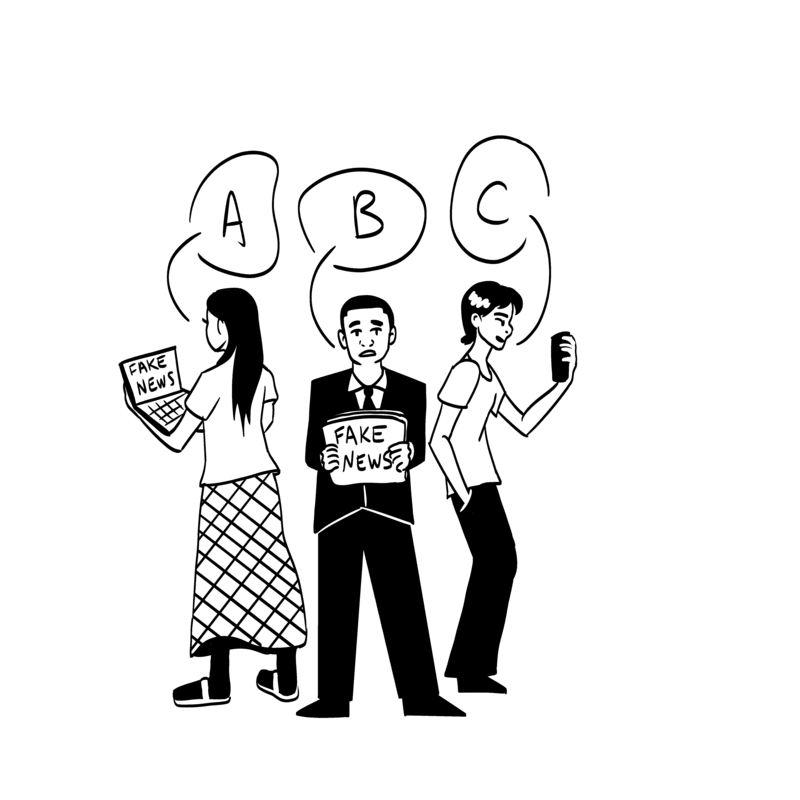 Others are more concerned with news having a political bias too far in either direction, and, shortly after the election, there were infographics circulating social media that highlighted which news sources were the most centrist and, therefore, the most reliable. One of the least trusted news sources on either side of the aisle is Buzzfeed News. The organization's overt liberal bent angers Trump supporters and anyone against political bias of any kind in the media, but even liberals constantly make fun of the sort of gif lists and click-bait content for which Buzzfeed is famed. This mockery is misplaced, however. For one thing, Buzzfeed has a stellar investigative unit, and, for another, it extensively fact checks its pieces, which is far more than can be said about sources like Breitbart. Breitbart frequently produces bogus reporting with outright lies designed to reinforce its writers' political biases. A more obvious example of one such piece is the recent article "Foreigners Now Account for 61 percent of Federal Arrests." In this article, Ian Mason makes the coded argument that immigrants are more dangerous than other Americans by misconstruing the claims of cited reputable sources in order to make his own claim seem more plausible. He uses a recent study from the Pew Research Center that found that 61% of federal arrests occur along the southern border; however, Mason entirely ignores the part of the report showing that this increased share of federal arrests is due to the disproportionate (and growing) amount of resources put into policing the border, not because more crimes are being committed. When there are news sources like Breitbart that so blatantly spread lies to confirm ideological bias, picking on Buzzfeed is poor prioritization. Just because the site publishes entertainment articles like "Literally Just 19 Very Large Cats" doesn't mean that its in-depth reports on Trump's conflicts of interest or a global supercourt should be taken any less seriously than investigations done by print news. It is dangerous to assume that any piece of journalism is free from bias, because language itself is inherently biased. Even media considered centrist is labeled as such because it provides multiple perspectives — not objective truth — on an issue and focuses on one perspective at a time. Especially when it comes to something as subjective as political values, bias is unavoidable. The best one can do is be aware of one's own biases and the biases of the media one is consuming. Political bias is only an issue when it leads to the intentional spread of misinformation. Reading an article with a clear liberal or conservative bent is completely fine as long as it has been thoroughly fact-checked. Simply having an opinion does not constitute fake news — but knowingly using falsehoods to back up that opinion does.